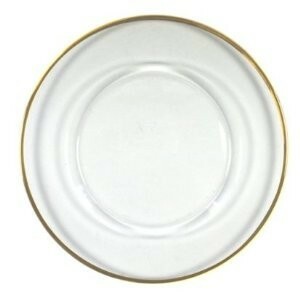 Home > Products > ChargeIt By Jay Round Gold Rim Glass Charger Plate 13"
This item will be back in stock May 30th. Order now to reserve. Add a touch of sophistication to your guests' dining experience with the ChargeIt By Jay Gold Rimmed Round Glass Charger Plate 13". This intricately crafted piece features a clear glass bottom with a gold rim. The superior craftsmanship and elegant design will provide a striking decorative base that is perfect for highlighting multiple course meals. Boasting a high quality construction and eye-catching aesthetics, this charger plate will beautifully complement a variety of upscale settings, making it an excellent option for your restaurant, catering company or other food service establishment.